Let's Tour Akihabara's Newest Nerd Hotspot. Together! The newly-built Akiba Culture Zone is a 7-floor building. It's the geek district's newest landmark, a mere four minute walk from the station. What wonders await inside? The Akiba Culture Zone first opened this summer, with the third to fifth floors opening late last month. The sixth floor is slated for a November opening. It's essentially a big Japanese department store. Instead of being filled with designer clothes, it's packed with designer nerd goods. Japanese department stores are increasingly becoming specialized—more so than they already are. For example, it's not uncommon for Japanese department stores to separate floors by clothes targeting women in their late teens and early twenties, late twenties and early thirties, and so on. In Osaka and, and as of last month, in Tokyo, Hankyu Department store created a completely separate department store, Hankyu Men's, that only sells men's clothing. The women's clothing is located in another Hankyu department store across the street. Thus, we have a department store in Tokyo's geek district dedicated to...geeks! 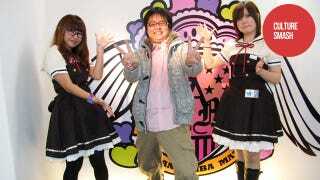 Website Gpara visited Akiba Culture Zone, snapping pictures. The basement floor, like the basement in so many department stores, is food. Here, it's an actual food court (usually Japanese department stores have fancy supermarkets in the basement with restaurants on the upper floors). The first and second floor are K-Books, while the third floor has shops specializing in figures, t-shirts, and idol goods. The fourth floor offers more figures as well as a military goods shop and a clothing store for fashionable otaku, while the fifth and sixth floors have cafes, complete with karaoke. It's one-stop shopping, and old Akiba hands will no doubt lament this as another reason why Akihabara and otaku culture have become over-commercialized, if not diluted completely. Figure shops, I get, but clothing stores aimed at otaku? Check out the Akiba Culture Zone photos in the above gallery.